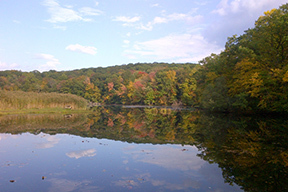 The 1,082-acre Mountain Lakes Park is Westchester’s northernmost county park. It is characterized by a rugged landscape and native hardwood forest with miles of trails. The park boasts five lakes and a spectacular overlook, which makes for breathtaking hiking destinations. Mountain Lakes Park offers the total outdoor experience including camping, fishing, ice skating, hiking, nature exploration, snow-shoeing, cross-country skiing, picnicking and a high/low ropes challenge course. Got a wedding, party or special event to host? Consider our attractive and spacious lodge/dining hall, which accommodates up to 300 of your guests amid woodland splendor. Our commercial kitchen will meet and exceed all of your caterer's needs. If you're looking for an even bigger adventure, extend your stay by renting our yurt village for an overnight. Review our wedding brochure or call the park for information and camping reservations. During July and August, the park is home to Camp Morty, a traditional camp experience for underprivileged children residing in Westchester County. Park hours: Open seven days a week, dawn to dusk, year-round. Dogs: Must be leashed. No dogs allowed in picnic areas.